First, thank you for your sweet words and kind encouragement after my brain dump this weekend. I know that its only been 4.5 months since my girl went to heaven and this healing thing takes time…lots and lots of time. I am just at the beginning. Thank you for your patience, especially in this space. I feel a bit bi-polar at times with the high and low pitches of my life these days, but you guys stay with me and for that I am so very thankful. Second, it’s time to get back on the gratitude train. 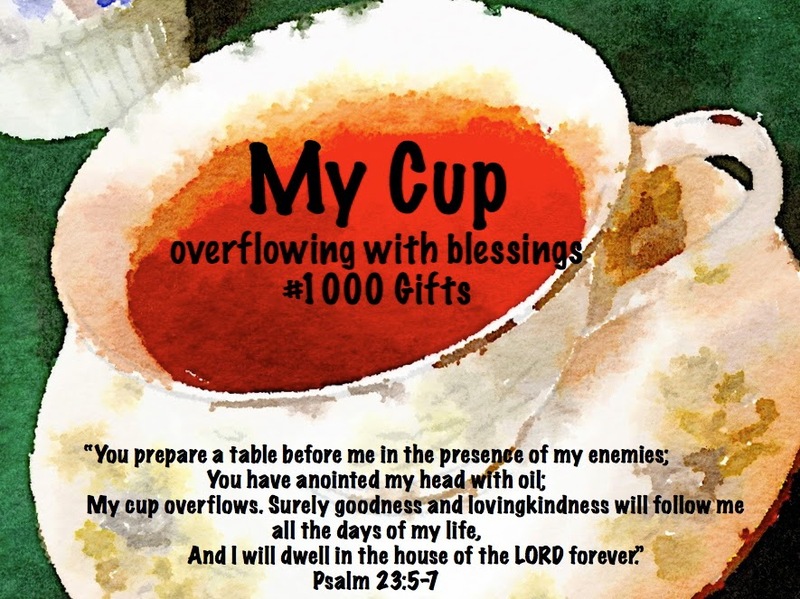 It has been eight months since I have done a post listing my blessings. Way too long for this practice to be pushed onto the sidelines.It helps me get out of my head and believe me, this is a good thing. It’s scary inside my head. Very, very scary. a raspberry yogurt smoothie. I have two little four year-old helpers today so we started the day with a little raspberry love. Next up caffeine for me. LOTS of caffeine. It is Monday after all. A chair in the living room. The girls I watch two days a week are in the midst of a Barbie fashion show, playing with magnets AND giving Anna and Elsa some center stage time. “Let it Go” is sung at least three times a day when they come. I don’t mind at all (she says as her eye twitches). Two four year old girls with active imaginations. They come up with some of the BEST lines when playing. Shining and it is going to be quite warm today. I see some outside time and maybe even a little water play if the humidity gives us a break. In heaven!! I guess I will have to come up with another category to replace this one. What do you guys think? What should go here now?? Tell me in the comments. Y’all know how much I lurve fresh flowers. I am happy just looking at them in the grocery store, let alone in a vase in my home. 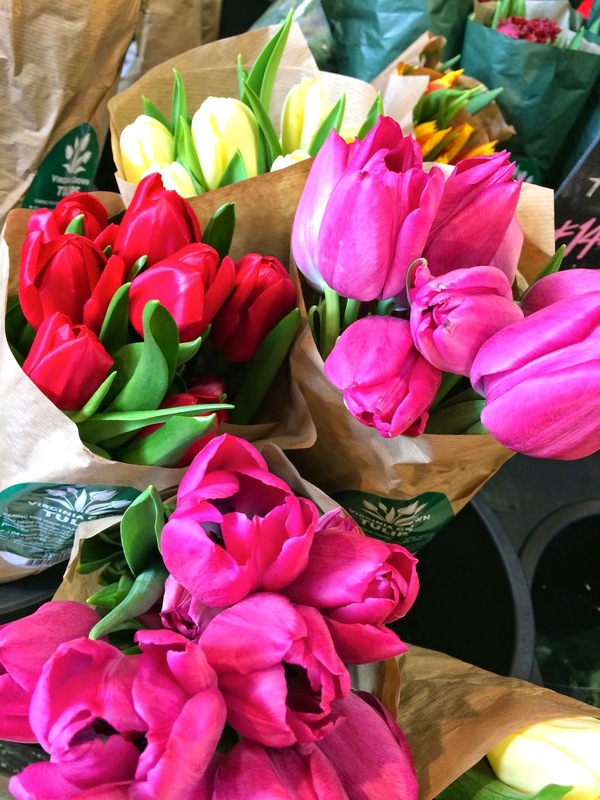 These tulips were at Whole Foods the other day and they made me swoon. Seriously y’all, look at those deep colors. I do love me a blast of hot pink. I will play catch up with What I Wore this Wednesday. I am trying to remember to take a photo of my outfits as we o along. Some days are better than others. Today I am wearing yoga pants and a loose knit top. It’s my Monday uniform. Oh so many things. I have been praying about and pondering this space, it’s purpose, my life and it’s purpose.I have been thinking about deep things, preparing to make some hard choices for the betterment of my family. All while navigating this grief journey. Not easy but necessary. The recipe is quite simple. Scrub five pounds of potatoes (skin on) and place in a pot. Cover with cold water. Bring to a boil. In a separate pot, boil four eggs. While the pots are going, finely chop one large onion. Once the eggs are hardboiled, chop them and place into the bowl with the onions. Once the potatoes are fully cooked, drain them and allow them to cool. 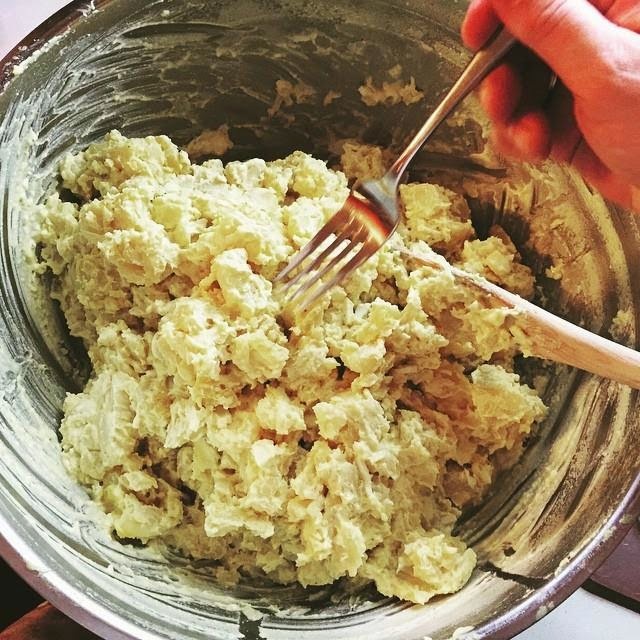 Then you take the potatoes and simply scrape the skin off, chop them into one inch pieces and place them into the bowl with the eggs and onions. You add 1.5 cups of mayo, 3 tablespoons of yellow mustard and salt and pepper to taste. You can add more mayo or mustard given your families individual tastes. That’s it. It is simple and very tasty. When I make it, it doesn’t take long for my guys to run through it. The second one is a BLT Pasta Salad. I will post that one tomorrow. I am busy making some baby and toddler dresses, followed by a table cloth for a sweet friend. Then it will be time to make some quilts I think. I promise more photos as I make my way through the “to sew” pile. 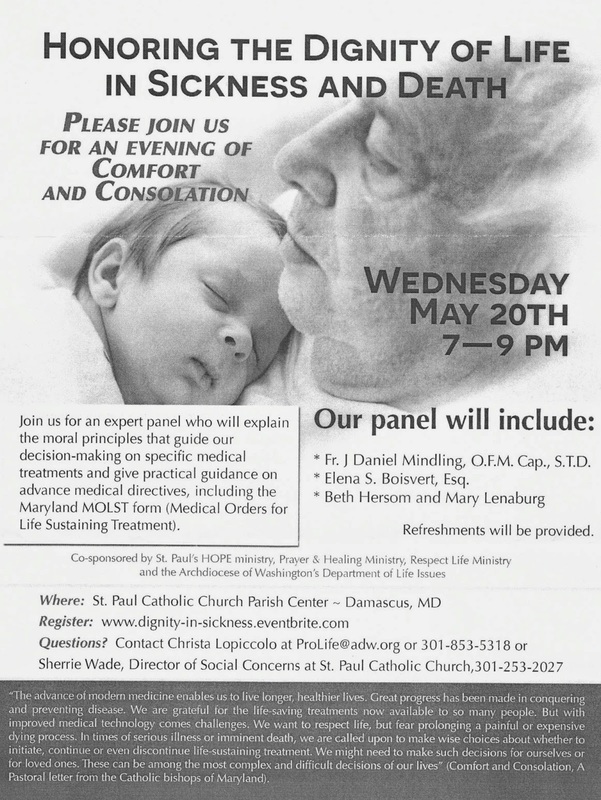 I am part of a panel discussion on end of life issues, this Wednesday at St. Paul’s Catholic Church in Damascus, MD. If you are able to make it, I would love to see you there. It’s not too late to register. There is no charge. I am also continuing the thank you note writing marathon and we have dinner plans tomorrow night with sweet friends. * for two sweet four year old girls who make my week one filled with wonder and laughter once more. * for blogging friends that I get to meet in real life. I am forever changed by knowing you IRL. * for Barbie Dolls and quick dress changes. * for glittery butterfly wings and tutu’s. They make my world magical again. * sweet friends whose door is always open, no matter what. * cartoons on an early Monday morning, allowing me to ease into the week with littles. * extra changes of clothes for pre-schoolers who don’t quite make it to the potty. * for you beautiful people, who made sure Miss Courtney would have a headstone. It will be beautiful. * my mother who has stood by my side from the beginning. He love and devotion are such a gift to me and my family. * for my book to finally be published. I know I only wrote a chapter, but to see those words in print is pretty special. * for my Youth Ministry kids. You challenge me and change me every single week. I am blessed to know you and walk this journey of faith with you. * hot dogs hot off the grill, lovingly surrounded by ketchup, mustard and pickle relish. * story time at the library with 40 four year olds – memories made! * a medium-rare steak and loaded baked potato washed down with a mojito – spoiled for sure. * a tablespoon of peanut butter dipped in mini chocolate chips. * a season finale to your favorite TV show that makes you really wish fall was already here. What’s sweetening your life? How can I pray for you? 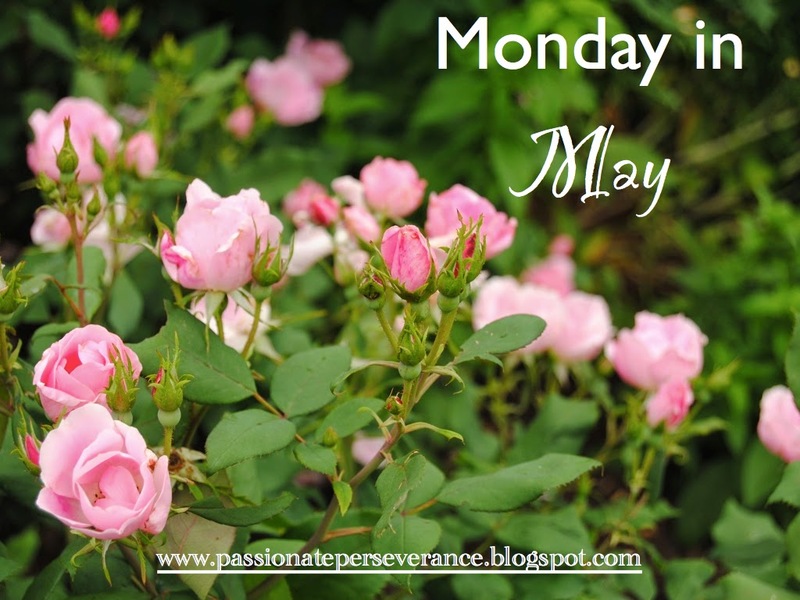 #1000 Gifts, In the Kitchen, Joy in the Journey, We Can Do This!! I"m so happy you've started writing your #1000gifts again! I have always enjoyed reading them! I would love to see more recipes from you – especially those that include bacon. I think I share your husband's bacon love. My mom made some candied bacon a few weeks ago and I could not stop eating it. So good! Continued prayers for you as you find your way! That's a great idea Beth. More bacon recipes. Jerry would be so happy to be a taste tester. LOL! Hugs to you friend. our grateful list!!! And that you are in the presence of two sweeties!!! Four year old girls are delightful!!! I'm glD you are seeing life through their eyes!!! Praying for you and family. *hugs* from this mama of a special one who you touch daily. Mary, my friend, Beth Hersom, is also a featured panelist where you will be speaking! Beth and I are both "Apert moms," in that we both have daughters (aptly named Sarah) who have Apert Syndrome. I think it's incredible what a small world we truly do live in. I live in Indiana, so I'm not close enough to meet you amazing gals in person, but my thoughts and prayers are with you on this, and I'm looking forward to hearing how it goes. Another idea for the Courtney is currently section could be a new puppy? Perhaps something that you could care for and cuddle daily would help you manage your grief. Or maybe a few laying hens if your neighborhood allows backyard chickens. They are soooooo entertaining! The chickens are currently… The puppy is currently… Maybe? Something completely new? Mary, I wish I could come to the event! Sadly, my husband will be working late and the whole sixth children thing poses a bit of a problem. I'll be praying for you (and offering a sacrifice or two because I'll be without help and a whole bunch of kids)! I was thinking instead of "Courtney is", what about "My Courtney memory for the day is" and you tell whatever jumps into your mind about her that morning. I think your new category should still be Courtney based…maybe something like…I hope Courtney is…. or I remember when Courtney…..